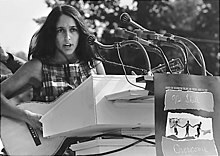 Joan Chandos Baez (/baɪz/; born January 9, 1941) is an American singer, songwriter, musician, and activist whose contemporary folk music often includes songs of protest or social justice. Baez has performed publicly for over 60 years, releasing over 30 albums. Fluent in Spanish and English, she has also recorded songs in at least six other languages. Although generally regarded as a folk singer, her music has diversified since the counterculture era of the 1960s, and encompasses genres such as folk rock, pop, country, and gospel music. ^ Broadus, Ray; Browne, Pat (2001). The Guide to United States Popular Culture. Popular Press. p. 56. ISBN 978-0879728212. ^ van der Kleut, Jennifer (February 4, 2013). "Paly Grad Joan Baez to Perform Benefit Concert for College Fund". Palo Alto Patch. Patch Media. Retrieved April 4, 2017. ^ Baez, Joan (1987). And A Voice To Sing With. Summit Books. p. 63. ISBN 978-5-551-88863-5. Retrieved August 1, 2010. ^ Baez, Joan (1987). And A Voice To Sing With. Summit Books. p. 62. ISBN 978-5-551-88863-5. Retrieved August 1, 2010. ^ Wald, Elijah (2009). How the Beatles Destroyed Rock n Roll: An Alternative History of American Popular Music. Oxford University Press, USA. p. 226. ISBN 978-0-19-534154-6. Retrieved August 1, 2010. ^ "The Joan Baez Web Pages". 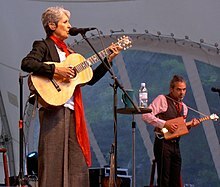 www.joanbaez.com. Retrieved February 16, 2018. ^ a b "Joan Baez". Biography.com. Retrieved February 28, 2017. "Joan Baez Appears at Stamford Palace". Stamford, Connecticut. November 14, 1989. Retrieved September 12, 2012. ^ Swanekamp, Joan (1980). 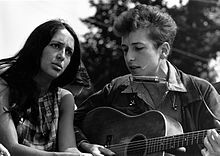 Diamonds & Rust: a Bibliography and Discography on Joan Baez. The Pierian Press. p. 9. ISBN 978-0-87650-113-9. ^ Swanekamp, Joan (1980). Diamonds & Rust: a Bibliography and Discography on Joan Baez. The Pierian Press. pp. 9–10. ISBN 978-0-87650-113-9. ^ Gray, Michael (2006). The Bob Dylan Encyclopedia. London: The Continuum International Publishing Group. pp. 30–31. ISBN 978-0-8264-6933-5. ^ Heylin, Clinton (2003). Behind the Shades Revisited. London: HarperEntertainment. pp. 158–159. ISBN 978-0-06-052569-9. ^ Baez, Joan (1987). And a Voice to Sing With: A Memoir. New York: Summit Books. p. 160. ISBN 978-0-671-40062-0. ^ Young, Jeffrey S.; Simon, William L. (2005). Con Steve Jobs: The Greatest Second Act in the History of Business. Wiley. ISBN 978-0-471-72083-6. Vague- cite page.